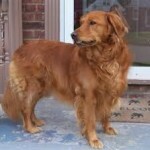 Sammy is a young-adult Golden Retriever who is loved by all who meet him. He was well-behaved in the house and with children, but had a fear of going up/down stairs and did not walk well on a leash. His owners worked from home and were diligent in his obedience training commands, but these two areas were an ongoing struggle for the whole family. They were in need of dog training in Pleasantville NY, as they live near town and are sidewalk accessible. Their focus was on achieving a relaxed and stress-free life with Sammy. They decided to look for adult dog training in Pleasantville NY, so they contacted me. I was very happy to see that Sammy did not jump when I arrived for my in-home initial consultation! However getting him up and down the front steps was a challenge. Patience, understanding his fear, and appropriate progressions was a huge part of solving this fear. After consistent repetition, Sammy grew to enjoy when it was time to exit the home. He felt confident in himself and made his owners proud of their accomplishment. Our next step was addressing the walk. It was evident that he loved to go on a walk, but was overexcited and barked/pulled towards those he saw. As a result, his owners were afraid to walk him. This led to him missing out on walks and developing a lot of pent up energy. I took Sammy’s family through my structured walk protocol which covered: body position, proper leash handling skills, correct timing, and how to address his reactivity. The transformation was almost immediate. Now that Sammy walks so well, he is able to enjoy more frequent walks and quality time with his family. There is no reason for owners to live frustrated and stressed with small rectifiable issues. With the help of a qualified professional, you can address these challenges and then enjoy a lifetime with your furry family member. Whether you are in need of dog training in Pleasantville NY or anywhere else, please feel free to contact me with any questions.